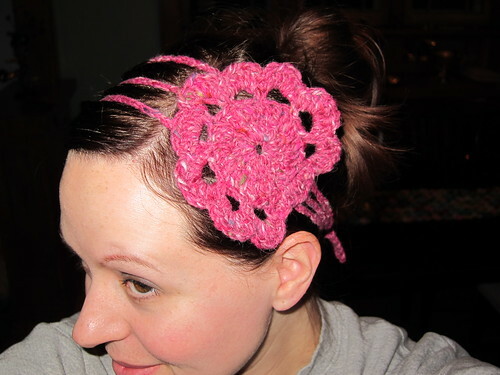 I decided a wanted a little something special to wear this Valentine's day so I grabbed some leftover yarn from my Strasbourg Hat and made this headband in one night. Modifications: None - I think I messed up the flower petals (wasn't paying enough attention while crocheting and watching tv) but I like it anyway. Can't wait to wear it to work on Friday and all day Sunday!!! 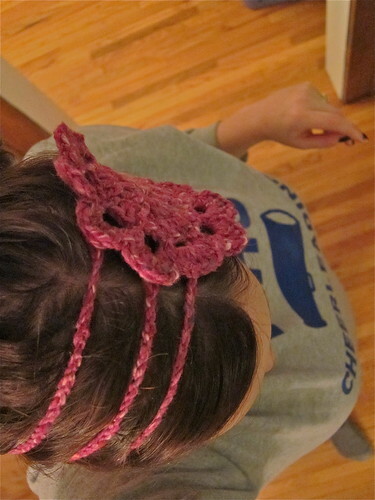 I love the 3 strand headband base and will definitely be improvising other crocheted flower headbands from my yarn scraps. Looks cute! Need to see in person to truly appreciate though. How do you keep it on? Does it tie? I can hear Kinley now - "mom, why don't make pretty things like Aunt Brandy does?"